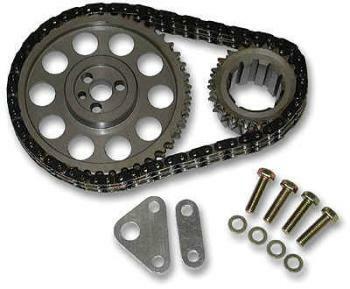 Manley Timing Chain Kits contain fully machined billet steel camshaft and crankshaft sprockets. Kits utilize a roller chain with .250” diameter rollers and adjustable 9 keyway crankshaft sprocket. Camshaft sprockets are machined for and include a Torrington thrust bearing. Kits also include all necessary hardware for installation.